• BA-2100: A Bigelow module. Volume: 2,100 m3. Weight: 100 mT. Crew: 16, Cost: $500M. • BA-330: A Bigelow module. Volume: 330 m3. Weight: 25 mT. Crew: 6. Cost: $125M. • Falcon Heavy: An expendable launch vehicle from SpaceX. Payload: 53 mT. Cost: $150M. • Propulsion Bus/Docking Node (PB/DN): A unit used to reboost the space station due to orbital decay coupled with a module that allows Bigelow modules to be attached together. Weight: 17 mT. Cost: $75M. • Space Launch System Block I-A (SLS I-A): An expendable launch vehicle from NASA. Payload: 105 mT. Cost: $750M. To live and work and be productive in space, you have to have a place to call home. While the Earth is certainly a great place to go home to (free air! free water! free – well, you get the point), it would become very expensive indeed if every time you knocked off your shift in space you took a ride back to Earth, and then got up the next day to fly back into space again! The obvious answer is to place your home, your city if you will, in space. Shopping around for what’s available to use to build our city, we happily find Bigelow Aerospace, makers of the famous BA-330 and BA-2100 space station habitat modules (the names of the modules denote the pressurized volume of each unit). These inflatable modules go into space, where they, well, you know, inflate. Astronauts then move into what is essentially a balloon in space (aren’t all space modules really just that?). Ah, but what a balloon! Crew capsules can dock at either end, and power is derived from solar panels, while excess heat is dumped into the biting cold of space using radiators. It even has windows! Home sweet home, indeed. To launch these excellent habitat modules into space, we obviously need a launch vehicle. Once again, shopping around for what’s available to use to launch our city we find two Expendable Launch Vehicles (ELV). These rockets haven’t been built yet, but so long as funding continues they will be one day. The two ELVs are the SLS I-A and the Falcon Heavy. So let’s build us a city in space, shall we? Hey, if the high school students at The Learning Community Charter School (www.tlcnm.net) in Albuquerque, New Mexico can have fun with this, then so can we. 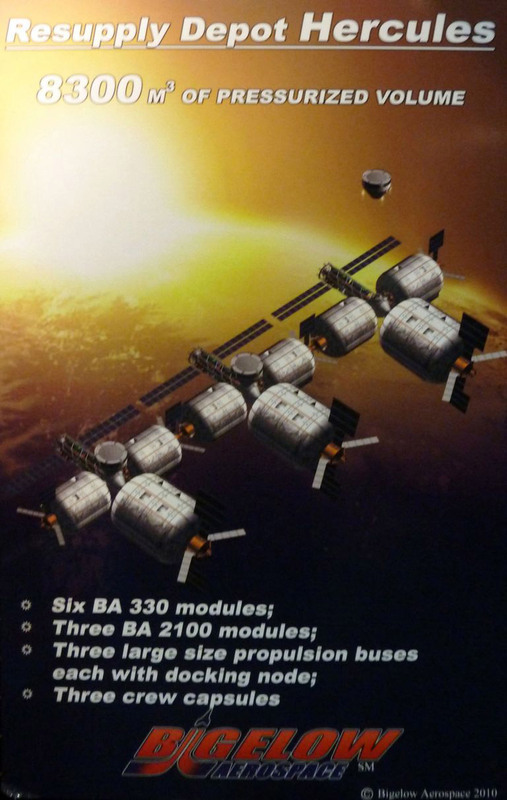 The folks at Bigelow Aerospace have made it easy for us: they’ve already designed a very nice space station! It’s called the “Hercules Resupply Depot,” but we’ll just call it “Home.” Thanks, Bigelow! Notice that our volume is close to the 8,300 cubic meters advertised in the Hercules image. While the two space station weights are nearly equal, the total volume is nearly ten (10) times the International Space Station with 14 times as many crew, all for 1/30th the cost. It’s keeping up with the Jones in reverse! Maybe when the I.S.S. retires in the near future the international community can move on up to a bigger and better place that’s a wee bit more affordable, si? For a more in-depth treatment of this high school project by Joe Maness & Rich Holtzin, visit www.stemfortheclassroom.com.